Ozark Trail Tents and Camping Gear (see https://leisurelegend.com) understands both the pleasure and concern that comes with camping. They build their tents thinking only of the customers and their specific needs while camping. The most common factors campers look for when purchasing a tent are space, set-up time, and weather and environment conditions. Ozark Trail offers different tent styles for any camper’s filtering options. Ozark Trail’s most basic sized tent is a 9’ x 7’ size tent that fits up to 4 people. The space inside the tent is big enough to fit a queen size air mattress or about 4 normal sized sleeping bags. The height is about 4 feet at its tallest so does not require too much bending down. Their 10’ x 9’ Instant Dome Camping Tent is a larger, more durable version of the previous and houses 6 sleeping bags comfortably. The 14’ x 10’ cabin style tent fits 10 people with comfortable moving space. Additionally, it has windows on every side of the tent and zip up doors on two sides of the tent. The 9 person 2 room Instant Cabin is the best tent in terms of space for sleeping and hosting activities throughout the trip. This tent 10’ x 10’ tent only houses 9 people but provides two private areas through a zip up divider. It is perfect for walking inside the tent at night with a height of 7 feet. Most Ozark Trail tents offer a fly option over the tent that is water-proof, however it might be better looking at specific tents able to withstand variable weather conditions. Their 10’ x 9’ Instant Dome for 6 people has been made more durable and reliable with having to withstand rain and wind conditions. The 14’ x 10’ 10 people cabin style tent has a large rain fly over the tent that is made to hold heavy rain for longs periods of time and should work in any heavy wind conditions as well. Ozark Trail has its premium set of tents specifically built for a quicker set-up time. 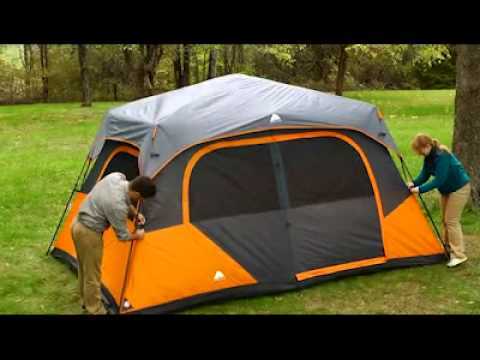 Ozark Trail’s Instant Dome 4 person, still in their standard 9’ x 7’ size has a set-up time of only 30 seconds. Because the poles are pre-attached to the tent all campers have to do is clip it to the ground and get going. A larger version housing 6 people is their 10’ x 9’ Instant Dome Tent with a set-up time of less than 60 seconds. The 14’ x 10’ cabin style for 10 people tent is a one of a kind in that the set-up time has been proven to be in less than 5 minutes. Even in its size, the tent has pre-attached poles and sets ups just as easy as the 6 person tent. The 9 person 2 room Instant Cabin has an incredible set-up time of only two minutes with only unfolding and extending necessary on campers’ part.